I just wanted to let you know how happy I am with the sliding shelves. I ordered four shelves; 2 floor mount and 2 half shelf mount on Oct. 23rd. They arrived yesterday and were pretty easy to install. They appear to be well made and are exactly what I was looking for, and as you presented on the website. Thank you for prompt, efficient service and for a product I am sure will prove to be a wise purchase. I will definitely be recommending your website to friends. I just wanted to drop you a line to let you know how happy I am with our new Sliding Shelves. I was really surprised to have received a custom built product so fast. You really didn’t cut corners on packing which ensured the shelves were received in perfect condition, all the way to Montana. I inspected all the shelves and they were perfect in condition and craftsmanship. I did put a quick coat of stain on them to match our kitchen cabinets, they turned out very nice. They fit perfect and installation of the sliding shelves, following your instructions, was easy. Never again do I have to get down on the floor to unload a shelf just to reach in the back to pull out the pasta pan. The full extension for our bottom pot shelf was really worth it. And of course I am a hero with the Misses for installing your wonderful Sliding Shelves. Thank you. Thought I'd let you know that the drawers were easily put into my cupboards and I just love them! I also appreciated your quick responses to my inquiries. Today I received the drawer that I had ordered on December 3rd. I'm very impressed with the construction and the look of the wood, plus the packaging was "top drawer". Sorry for the play on words there. I just wanted to let you know how pleased I am and will probably be ordering another one, or two. The price is very reasonable, as I have looked into other sliding drawers that cost much more. Thank you for providing such a quality product. I purchased about twenty (20) sliding shelves from you back in April 2011. I am very pleased with the quality and convenience the shelves provide. Great purchase. I have recommended them to several persons. 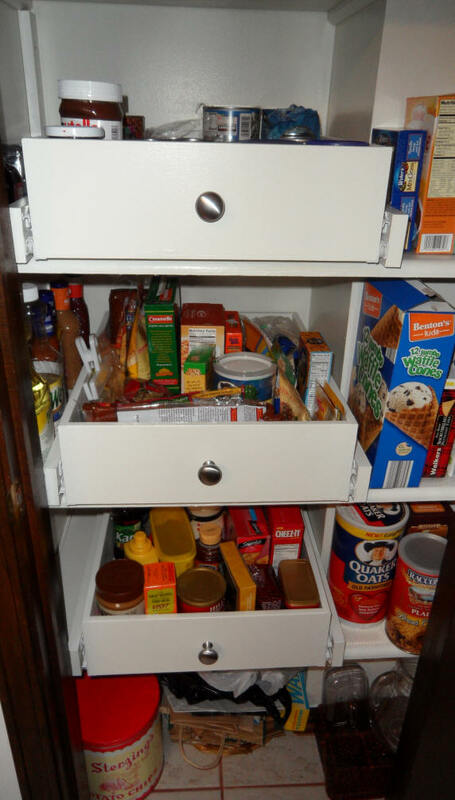 Attached are pictures of our pantry with your sliding drawers. Before we were always "losing" items that were in the back of the pantry. Things were made more complex since part of the pantry was cut out to make room for a clothes shoot. 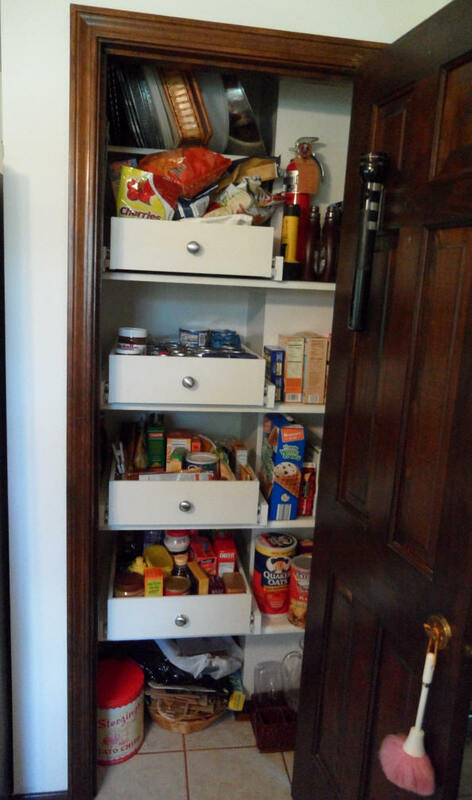 To keep the installation simple, I used the existing shelves, added 1x3 side rails to attach your shelves to and in a few hours the problems of lost pantry items were resolved. Your drawers were well made. I priced out a professional installer and they wanted $1300 to accomplish the same thing. Today I unpacked and mounted the four shelves that were ordered on Order #001442. Everything went well except one of the plastic wheels on one of the shelves is cracked, causing that shelf not to slide smoothly. Please send me a replacement 21 3/4" DR rail assembly so I can make the necessary repairs. By the way, this is my second order of shelves from you - my wife loves the difference it makes in the pantry and kitchen. I am sure our kitchens will always have sliding shelves from now on! I just wanted to thank you - your shelves were as easy to install as you state. Piece of cake and they look beautiful! Just wanted to let you know that I received the last shelf for order 002207 on Friday. I stained and polyed them Saturday and Sunday and installed them Monday and Tuesday. I was a little fearful of the installation but everything went well. It was much easier then I thought. You guys are top notch with quality product and service. I will be only too happy to spread the good word! Good luck in your future successes. Thank you so much for your help to measure correctly. The shelves arrived in excellent condition and I've never seen such excellent packaging. They were easy to install, are excellent quality, fit perfectly, and work great! I'm so glad I found your website. I had previously considered ordering them from a different source for almost 6x the price (including installation)! Thanks again from a very happy customer. You may use me as a reference any time. My shelves have arrived and I am really pleased with them. I had contemplated making my own until I saw your web site. Comparing your prices with the cost of materials, I would have had to work at 20 cents per hour to match you. I am an experienced woodworker and recognize the high quality of your product. By the way, this is my second order of shelves from you - my wife loves the difference it makes in the pantry and kitchen. I am sure our kitchens will always have sliding shelves from now on! 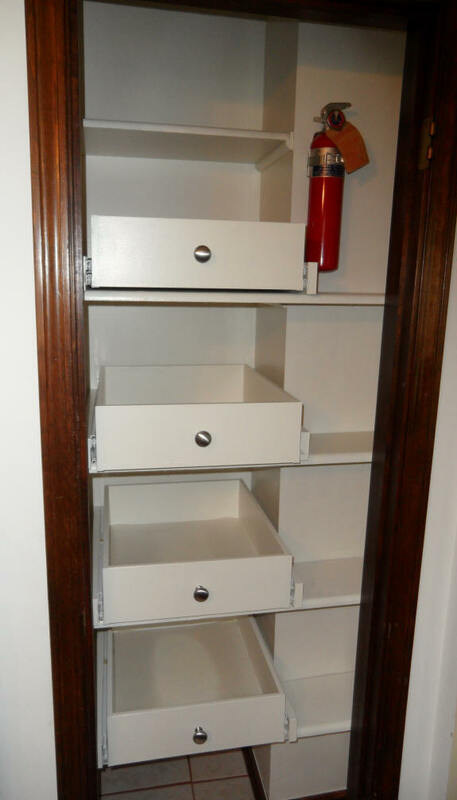 I received a shelf yesterday and installed it...I wanted to let you know it is fabulous...I wanted to see how you conducted business and the quality before I ordered more...I placed another order about 30 seconds ago. Your shipping guy/girl is excellent...I hated to open it ...it looked so cool just packaged. One slight problem (not yours) I misplaced the little plastic things...I will tell you I tore apart trash (like the compactor)...looked in the box...the garage ... my bed you name it...sort of like one of your socks lost in the dryer...I do not know where they went but they are long gone...I wish I could find them just to know where the hell I put them. Anyway if you can either with the new order or in an envelope ...please! Just wanted to let you know what I thought of your product...We order 2 of the sliding shelves for my kitchen cabinet....It was never easy getting to my pots and pans and having to get on the floor to reach in the back was such a pain...Not anymore.. I cannot tell you how much I love them...We got them just as you had stated within 5-7 days...They came very well packaged and everything was there...A lot of times when you order, something is missing ...Not with your product...I loved the way they were made.. Not a cheap product at all...My husband put them in within a few minutes...I know that I may have lost a few inches on either side because of the opening, but it was well worth it....I don't even miss that much gone.....I searched for days trying to find the right product for that...I searched on the wire baskets, and even the sliding shelves from other companies cost so much...Then I found your website and so glad I did....I hardly ever send in a response when ordering but I just wanted you to know how much I love them....THANK YOU- THANK YOU-THANK YOU!!!!!!!!!! I received and installed all of the sliding shelves. Great packaging for shipment, everything came in perfect condition. My wife is very happy with the workmanship. The only thing is that I need 2 more of the plastic tips (the anti-scratch your inside of the door things). Two of the large sliding shelves are behind split doors so I need to install the tips on each side. Could you send me a couple more? Thanks very much. I will highly recommend you to all our friends. Just installed the economy shelf in my motorhome. It installed easily, just as advertised, and looks better than factory original. First, I wanted you to know how happy we are with the sliding drawers we purchased from you. They are absolutely wonderful and just seems to add to the efficiency and space of our kitchen. And the installation was a snap!!! Would it be possible to get two more of the "plastic things". I ordered six drawers which all go on cabinets with double doors. You sent me 10 plastic things, so I am two short. I just wanted to say “thank you” for a great product and smooth transaction. Seldom do things go as expected but this was one of those rare times. The shelves were as described, were easy to install, and were shipped quickly (UPS lost one of the three boxes but it came the next day and was no fault of yours). I am one happy customer! A few weeks ago I ordered two small shelves from you as a test. I liked them so well that I ordered eight more for various locations in my house. They arrived and I installed them today. Everything went beautifully. Your product is well engineered and carefully crafted, your installation instructions are lucid and thorough, packing is careful and fully protective, and the price is attractive! It's a pleasure doing business with you.